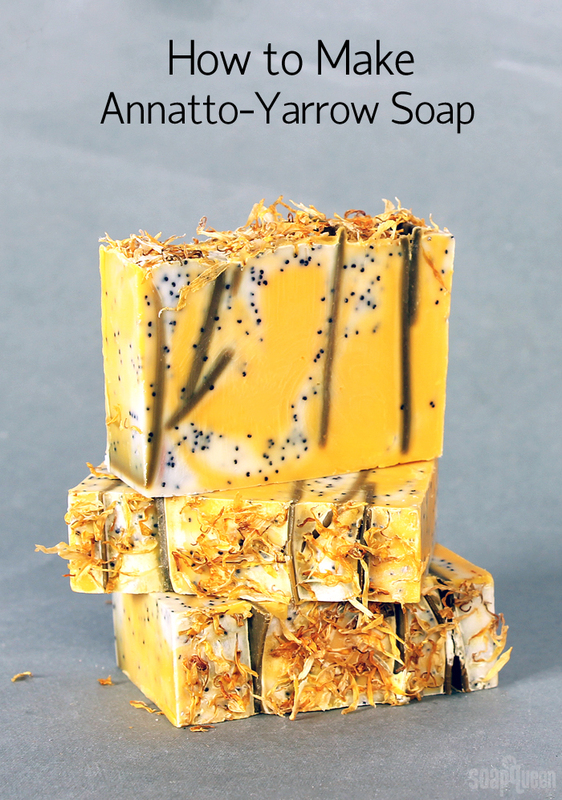 Turmeric powder gives cold process soap a lovely orange hue. 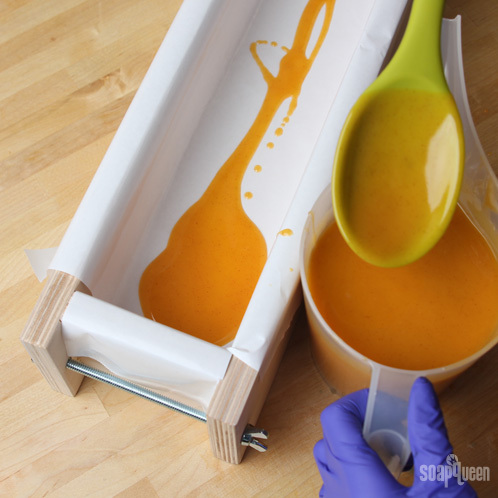 The shade of orange depends on how much turmeric powder is added and how it’s incorporated. 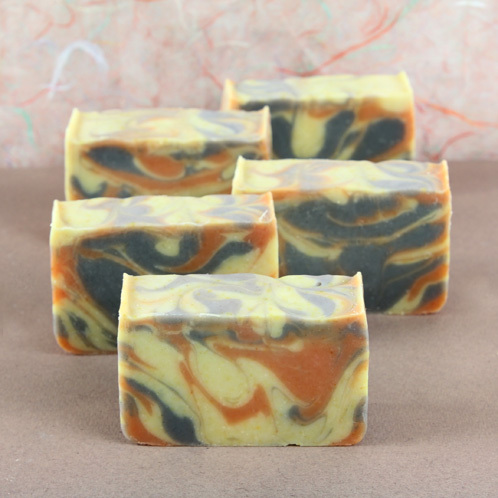 In this Turmeric Secret Swirl Soap, dispersed powder and an oil infusion are both used. 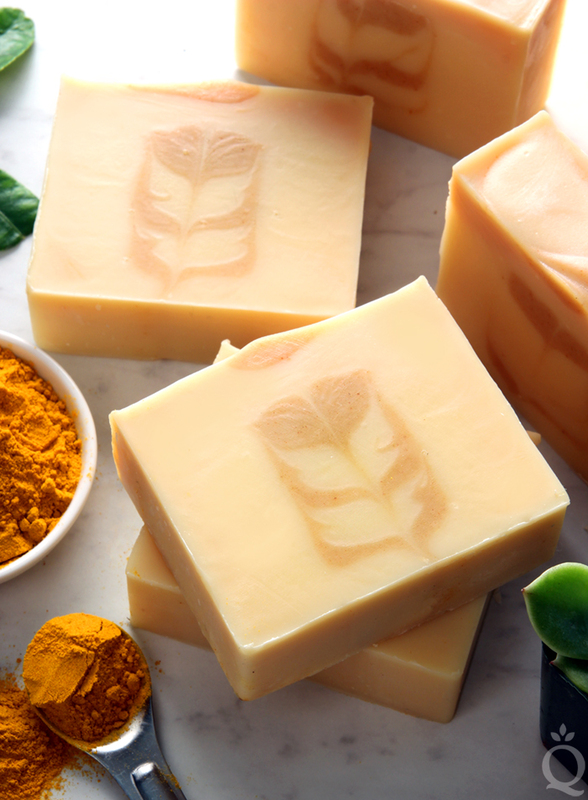 The turmeric-infused oil gives a soft orange color, while the darker orange shade is created by adding the dispersed turmeric directly to the soap batter. 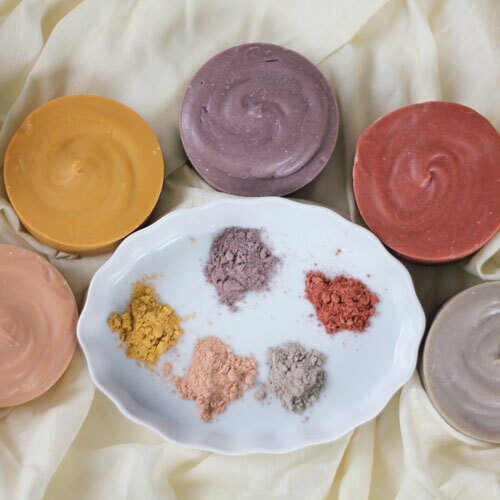 To see the different shades you can achieve, check out our turmeric color tests. 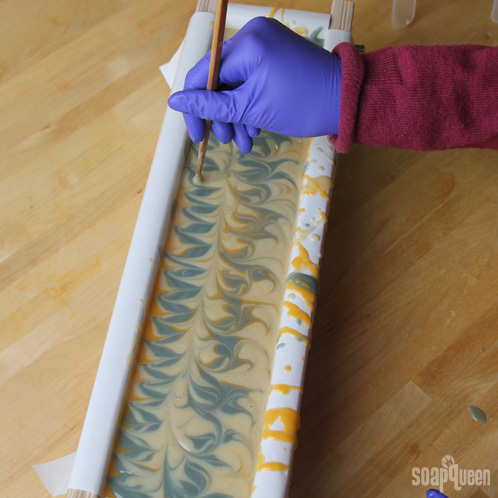 The swirl in this soap is a bold version of the “Secret Feather Swirl.” Made famous by Zahida of Handmade in Florida, the Secret Feather Swirl is an advanced soaping technique. 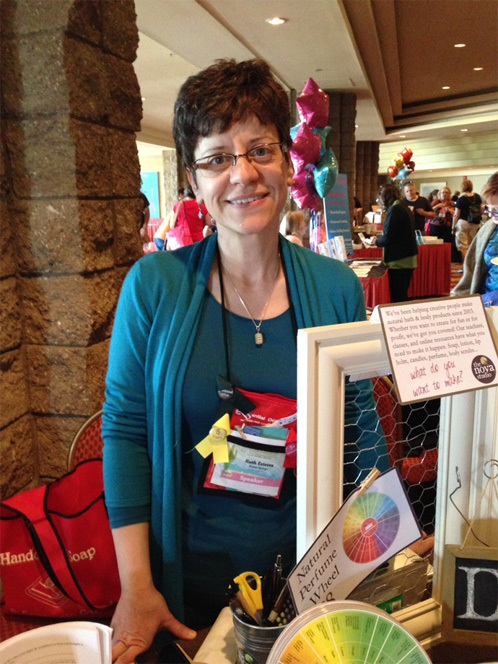 It involves layering various colors in the center and then using a Hanger Swirl Tool to create the “feather” effect. See the process in this video by Handmade in Florida. 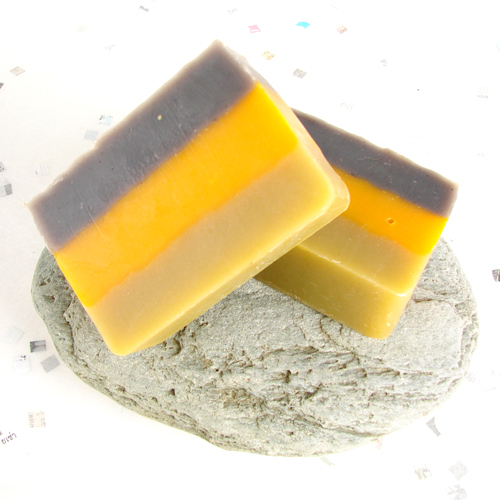 This soap is scented with the new ginger essential oil – it smells just like freshly grated ginger. 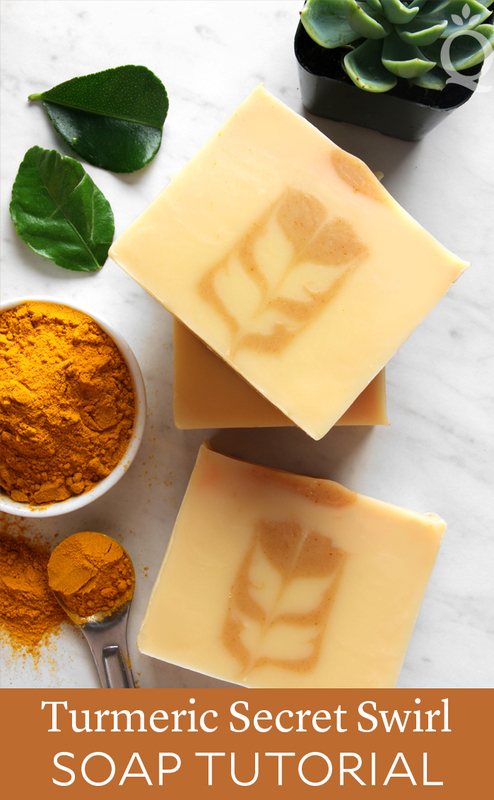 The turmeric powder does not scent the soap at all, so the ginger essential oil is the perfect scent to mimic zesty turmeric powder. 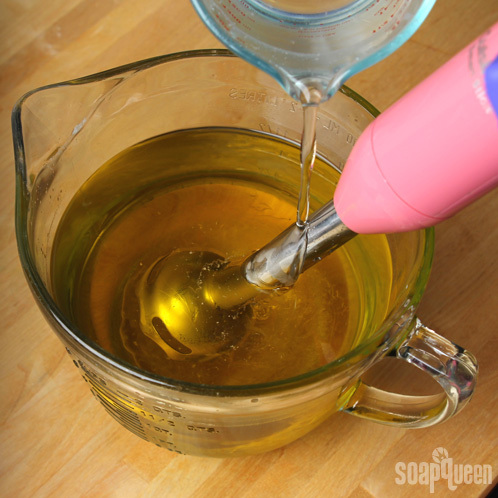 Keep in mind that ginger essential oil does slightly accelerate the soap. 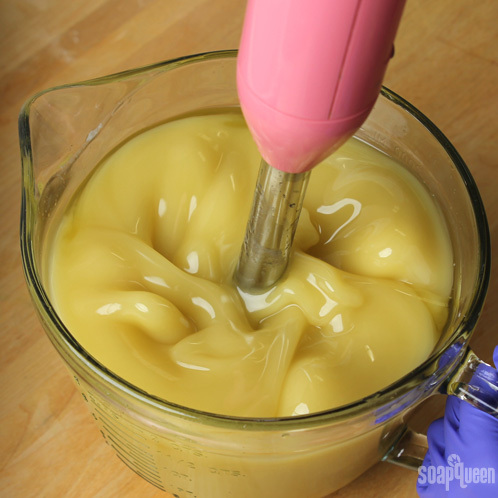 Use the stick blender sparingly for this recipe. If you take a look at the recipe below, you’ll notice it has a 2% superfat. This is to compensate for the 6 tablespoons turmeric-infused oil added to soap at trace. Learn how to make the turmeric infusion here. 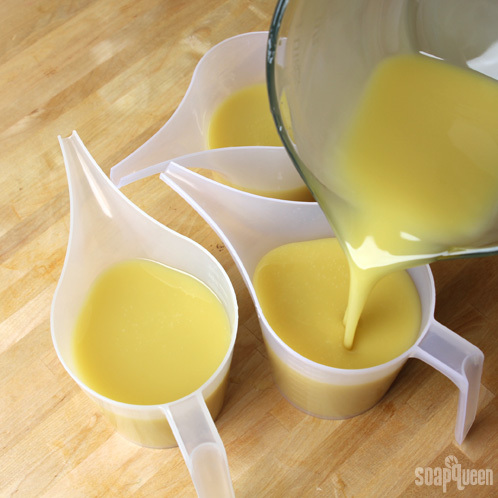 We used sweet almond oil for the infusion, but you can use a different lightweight liquid oil if you prefer. 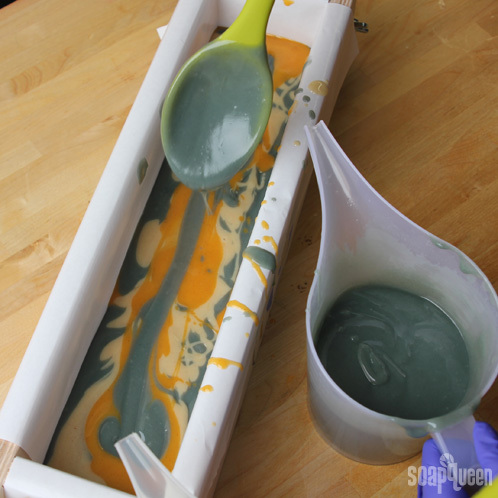 Adding color is one of my favorite parts of the soapmaking process. 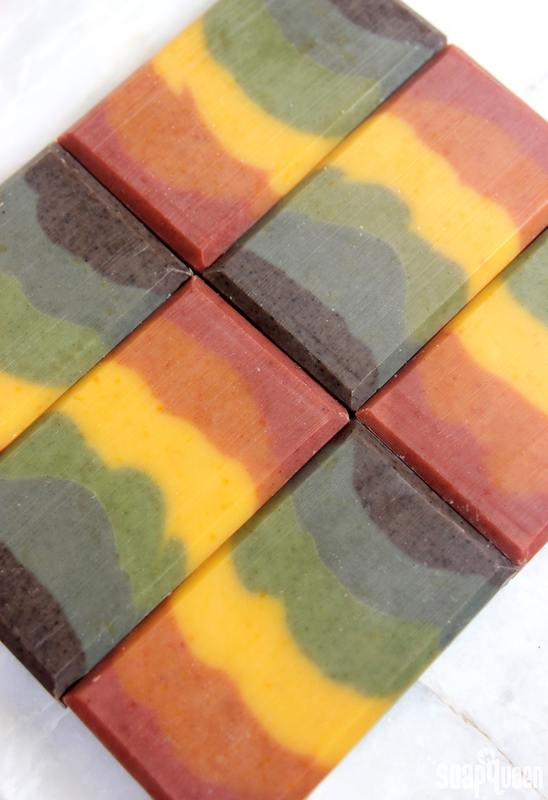 Color in soap can convey different places, scents, themes or moods. 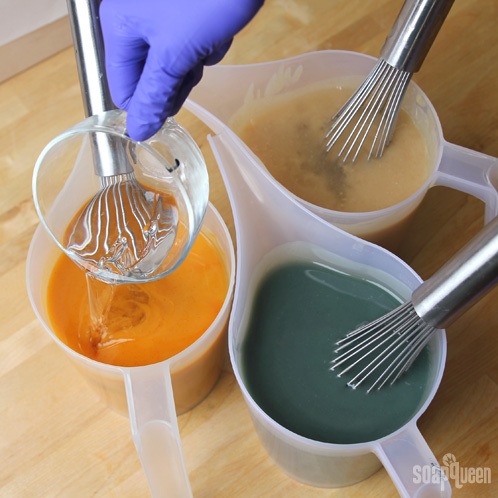 If you prefer to keep your soap as natural as possible, there are a wide variety of colorant options. 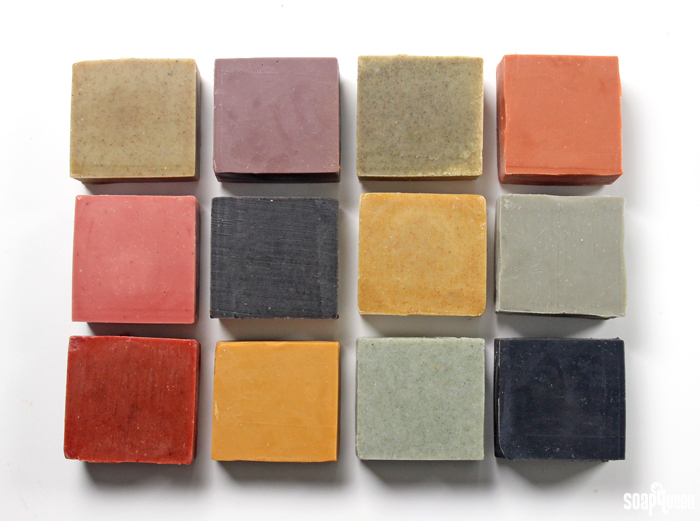 Various clays, herbs, botanicals and powders can give soap surprisingly vibrant hues. 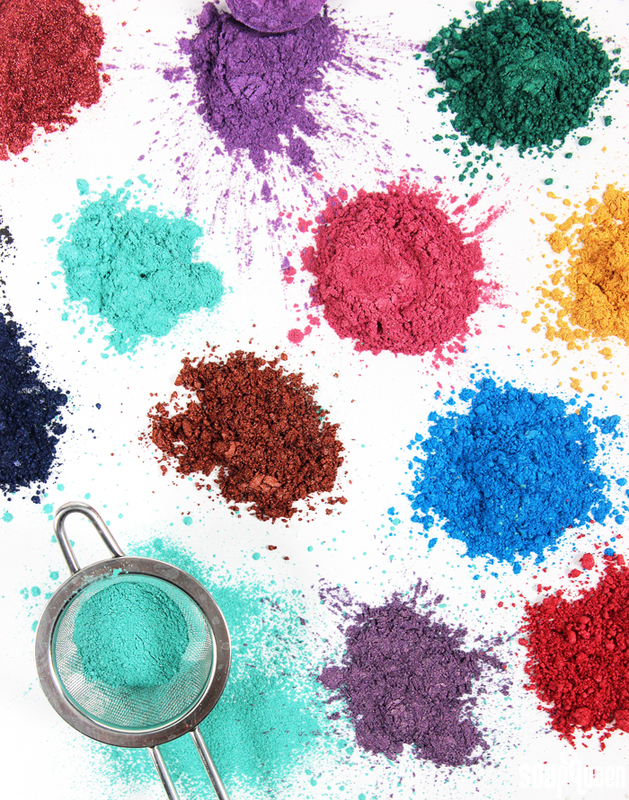 If you’d like to browse natural colorant options, click here for clays and here for herbs and botanicals. 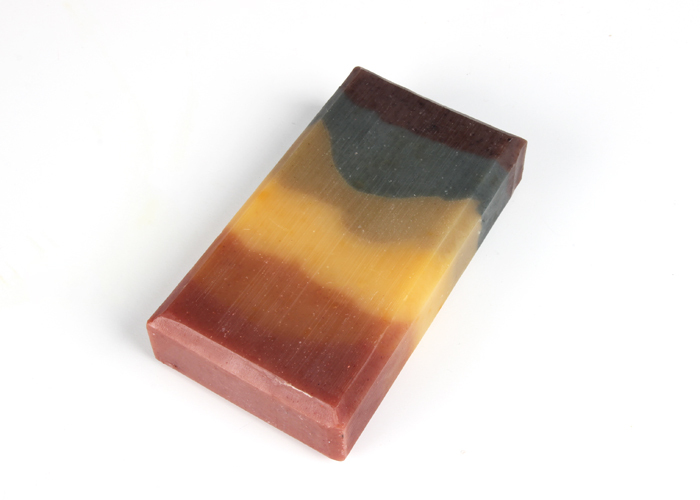 To demonstrate various natural colorants in cold process soap, I uploaded this photo onto Instagram. I was so blown away by the response (!). Because of that excitement level on Instagram, I decided to do a more in-depth post about the process and usage rates. 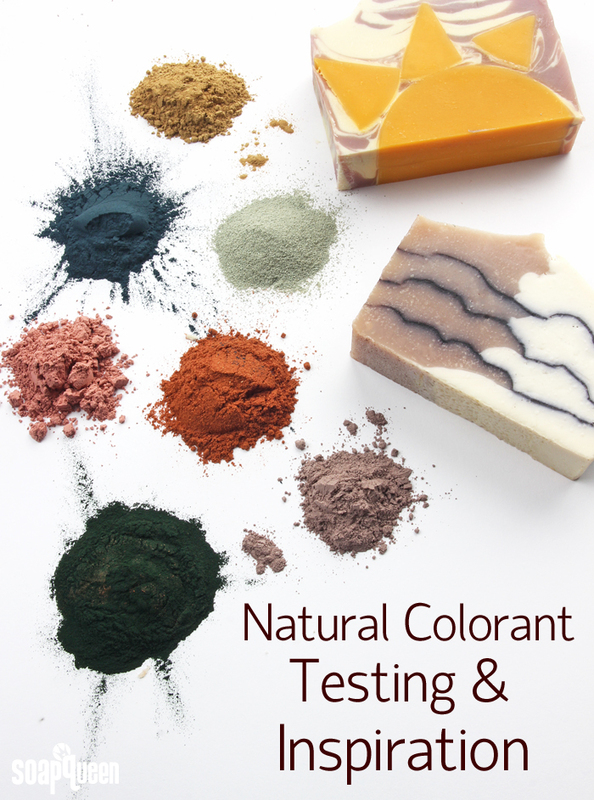 Check out the natural colorant tests below. Aren’t they gorgeous? 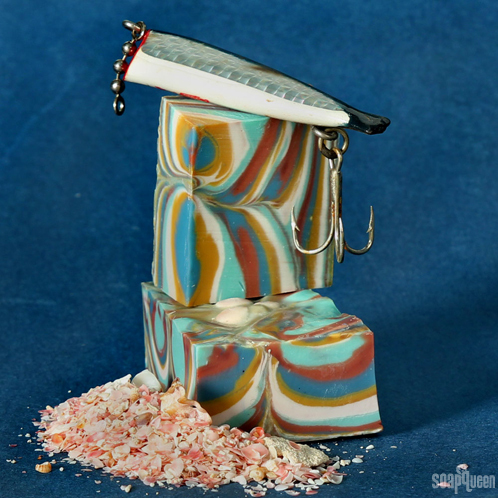 In particular I adore the way that rose clay, purple Brazilian clay and green zeolite clay look in cold process soap. 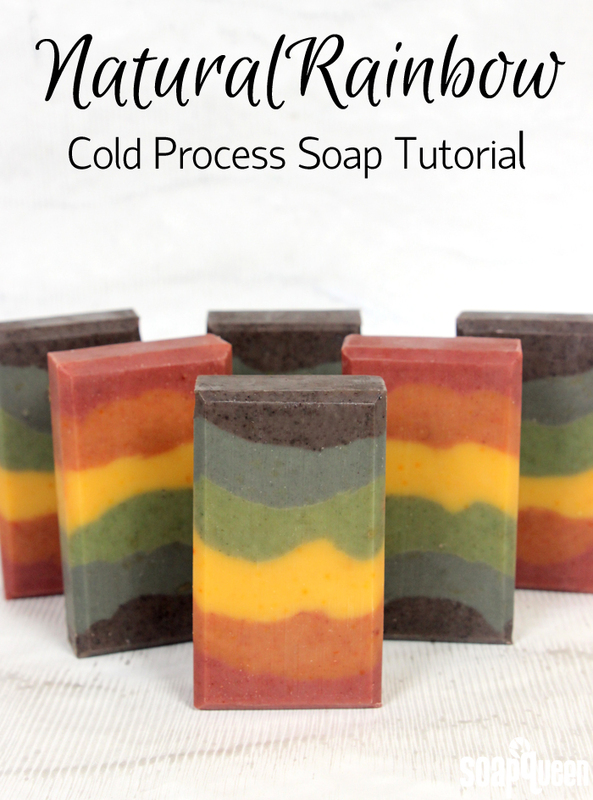 I love working with natural colorants and ingredients in cold process soap so much, I wrote a whole book about it! 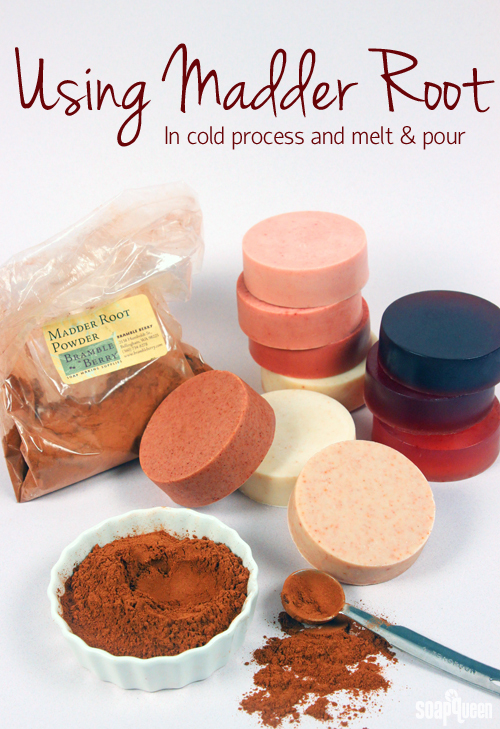 My new book, Pure Soap Making, is available for pre-order now and only uses natural and nature-identical colorants (like pigments and oxides). 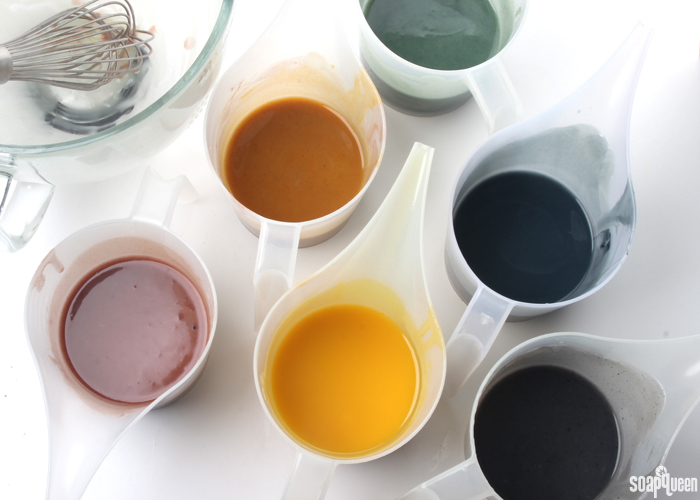 With spring officially here and March behind us, it’s exciting to start using lighter scents and colors in projects. 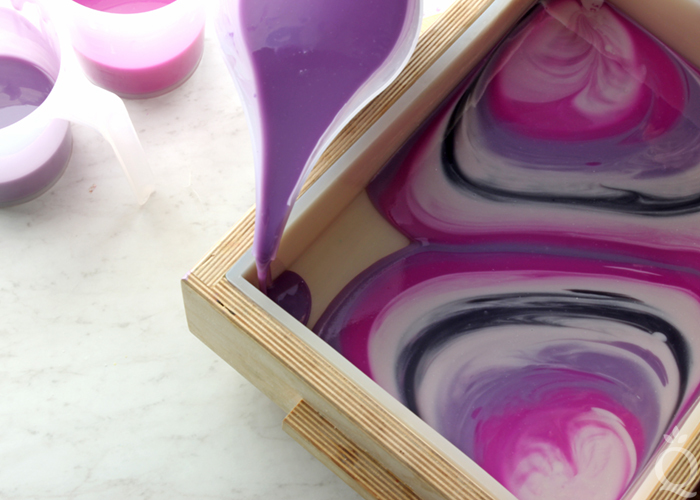 The Eggcellent Easter Melt and Pour Tutorial features both; the Sweet Pea Fragrance Oil and Eden’s Garden Fragrance Oil blend combined with pastel colors make it the perfect project for the upcoming holiday. The Havana Classic Series came to an end last week. 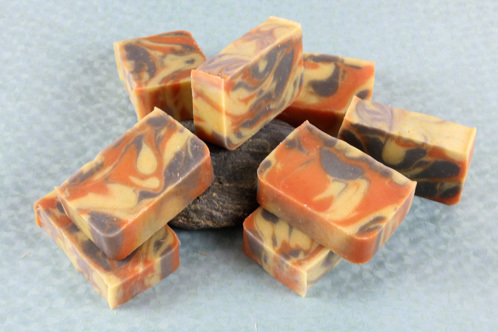 It included a variety of projects featuring our Tobacco & Bay Leaf Fragrance Oil. This scent is a great choice for another upcoming holiday, Father’s Day. 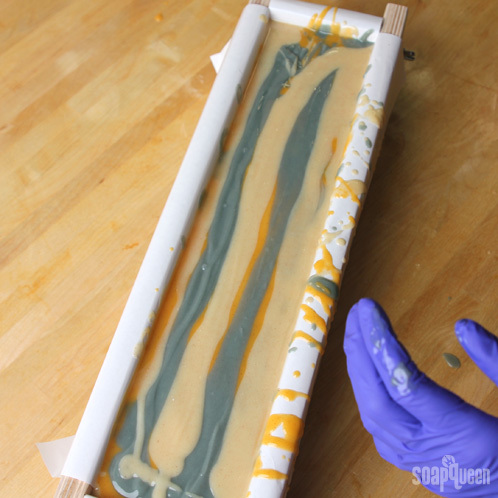 Colored with a masculine palette of blue, deep red and mustard, the Neptune Column Pour Cold Process Tutorial would make the perfect soap for men and women alike. 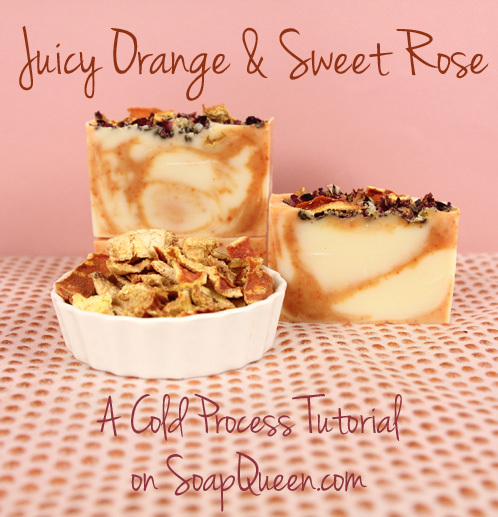 If you are looking for more manly projects, check out this Easy Whipped Shaving Soap or this cute Golf Ball Melt and Pour Tutorial. Speaking of beautiful color palettes, the Facebook Photo of the Week features five gorgeously colored scrubs that really pop! 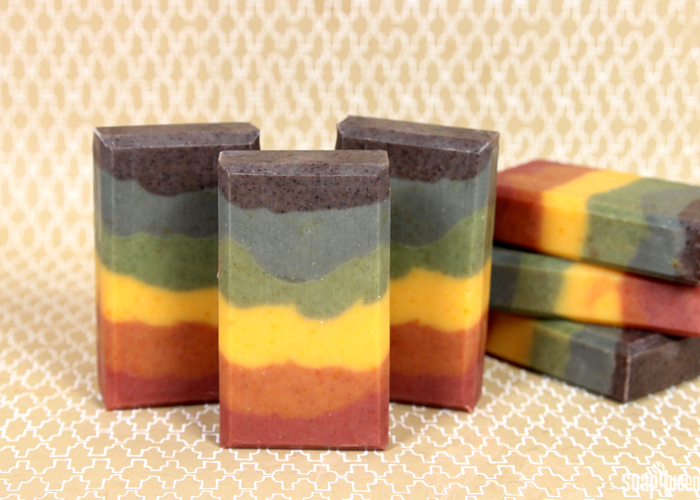 These natural scrubs from Stripped Soap Co. use clays to achieve these vibrant colors. 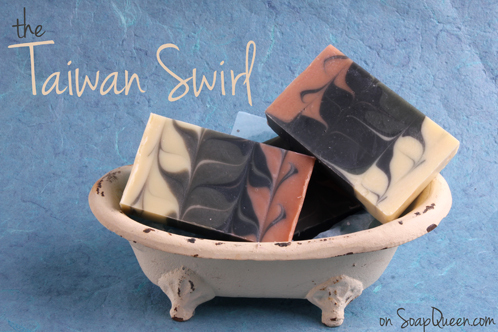 This beautiful technique is called the ‘Taiwan Swirl’ because of the first YouTube video that showcased this style of soapmaking. The most difficult part of this recipe is keeping the batter at a light enough trace to get wispy lines. You can change the look of the design by changing the size of the dowel/chopstick/skewer or swirling tool. 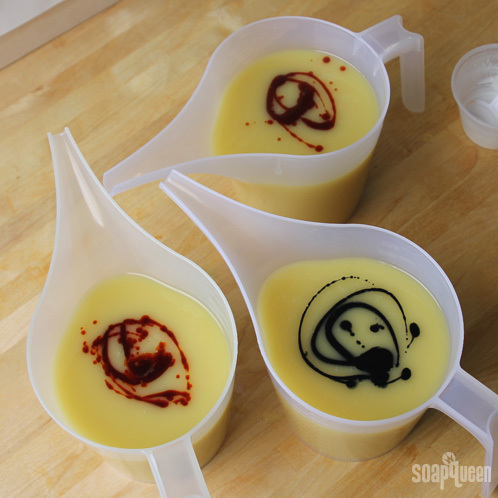 This recipe used a larger tool and a thin to medium trace to achieve the final product. Bonus! 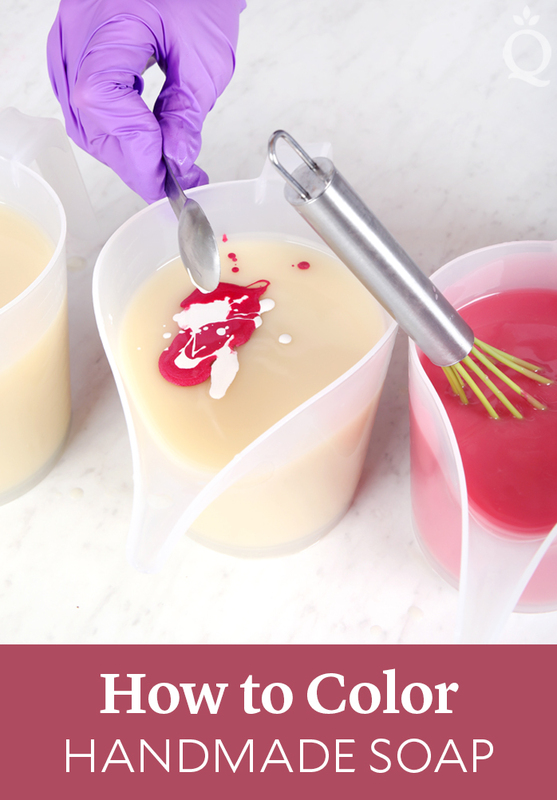 The new Multi-Pour Sectioning Tool makes it a breeze to separate the 4 colors in this recipe that create the unique design. Scroll down to step 7 to see how to use the dividers. 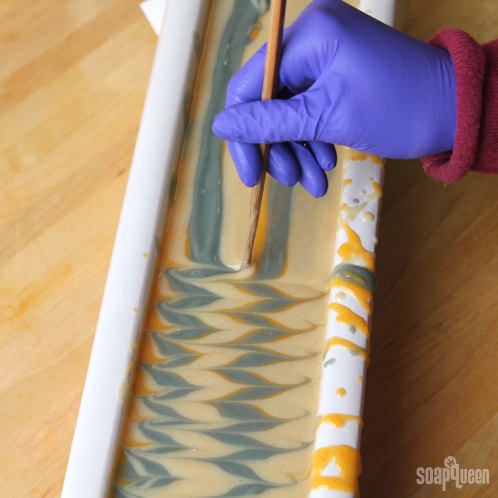 The first thing anyone sees about your soap creation is its color and shape. 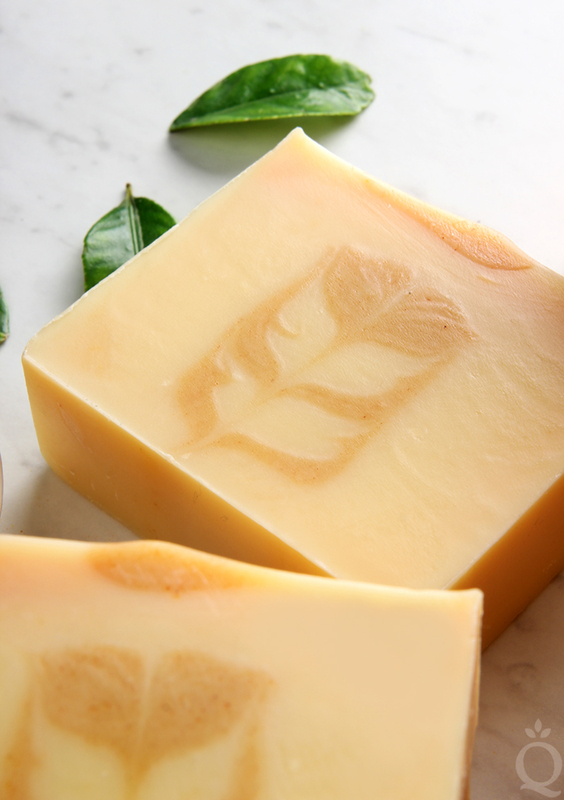 The thing that will intrigue a customer and get them to pick up a bar of soap is not the scent; it’s the color. 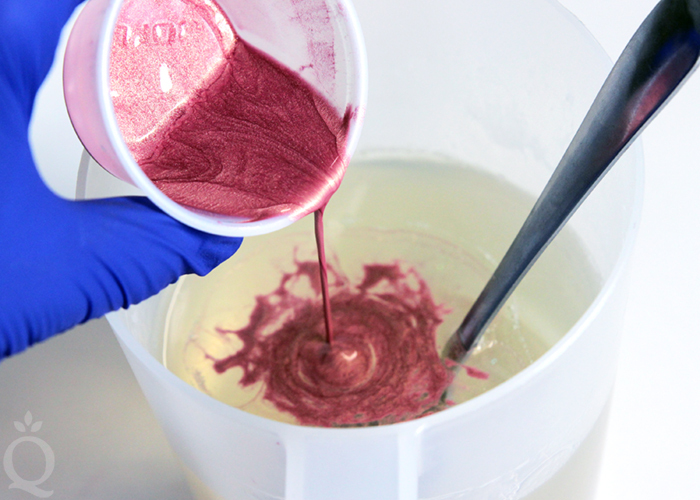 From LabColors, to micas, color blocks for melt and pour and pigments, there are many options for coloring your soap. 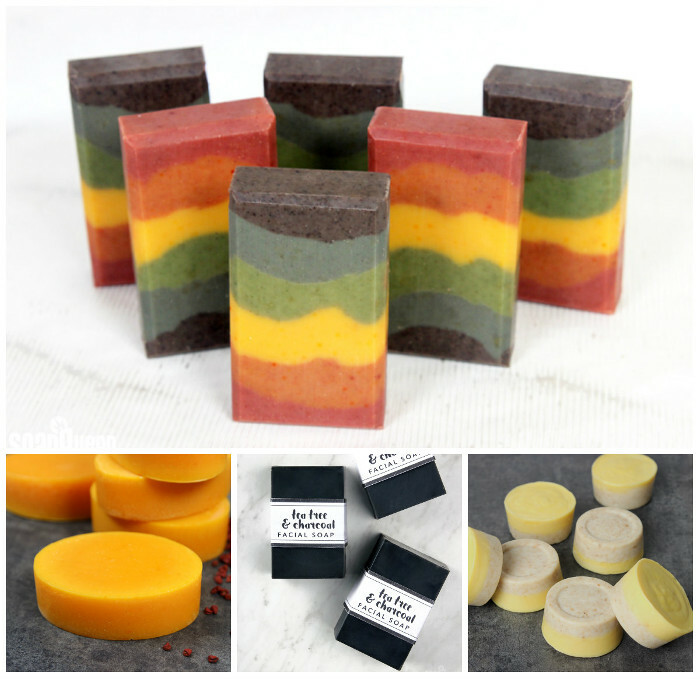 If you prefer to use natural ingredients in your soap, you can still achieve vibrant, beautiful colors using natural colorants. 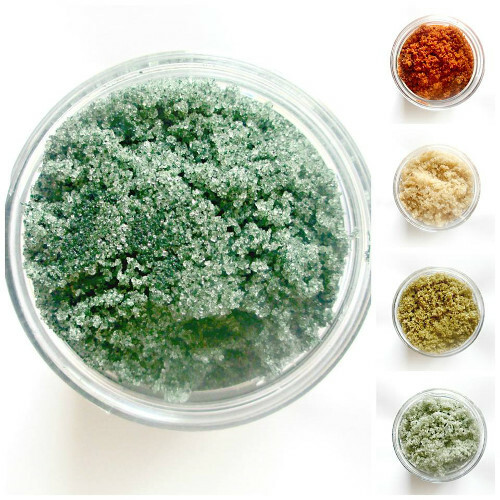 Natural products that impart color include clays as well as herbs and botanicals.